Mobility is something that many of us take for granted in our lives. Many people do not even think about how some people struggle with taking just even one step or even moving an arm. Having a physical disability especially when it comes to walking or moving body parts can really impact a persons life dramatically. Have you every thought about, what if I couldn't go outside and hike? What if I could not take public transportation? What if I could not play a sport because I can't walk, never mind run? The cool thing is it is 2015 and assistive technology has come a long long way. So now, you can go hiking, you can take public transportation, and you can play sports! This website shows you many different resources involving mobility accessibility that you can use in your daily life. The MBTA Access Guide is a manual for users with disabilities to help them know what they can access with public transportation. The manual can help customers plan a trip on the fixed route system and provide information on using farebox and their vending machines. The Action Trackstander allows you to be able to visit the outdoors without getting injured. This great wheelchair allows users to stand up and go over rough terrain while hiking with friends or family. It does not only have to be used for hiking. Anything outdoors you can think of it can be used for! 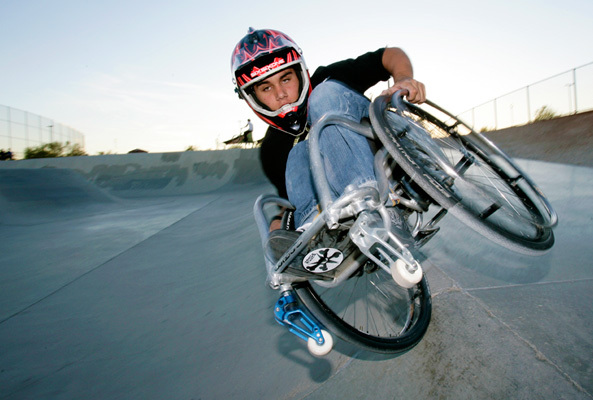 Rowheels Rev is a great wheelchair that can be used for sports. If you want to play basketball, volleyball, soccer or any other indoor sport this product is for you! It allows users to pull the hand rim to drive the wheelchair forwards. You do not have to pull on the actual wheels, but you can put your hand on the outside of the rim and move that way and you are not straining your arms that way either because you are pushing your arm backwards instead of forwards.